WHEELS, 18" X 8" (45.7 CM X 20.3 CM) MULTI-SPOKE MACHINED FACED ALLOY with polished face and Sterling Silver finished pockets (STD), TRANSMISSION, 6-SPEED AUTOMATIC, ELECTRONICALLY CONTROLLED WITH OVERDRIVE includes Driver Shift Control (STD), SUMMIT WHITE, SEATS, FRONT BUCKET WITH SEATBACK MAP POCKETS, ENGINE, ECOTEC 2.4L DOHC 4-CYLINDER SIDI (SPARK IGNITION DIRECT INJECTION) with VVT (Variable Valve Timing) (180 hp [134.28 kW] @ 6700 rpm, 171 lb-ft of torque [230.85 N-m] @ 4900 rpm) (STD), CASHMERE, PREMIUM LEATHER-APPOINTED SEATS, AUDIO SYSTEM WITH NAVIGATION, AM/FM/SIRIUSXM STEREO, SINGLE CD/DVD PLAYER AND MP3 PLAYER WITH NAVIGATION IntelliLink with 7" diagonal touch-screen display, GPS navigation system, USB port, Radio Data System (RDS) and auxiliary input jack, includes phonebook access, voice recognition for audio, phone, phonebook and music selection, Pandora and Stitcher Smartphone compatible, SiriusXM weather and data services, and software Bluetooth and Smartphone interface upgradeable, 1SL PREFERRED EQUIPMENT GROUP Includes Standard Equipment, Wipers, front intermittent, variable, Windshield, solar absorbing. 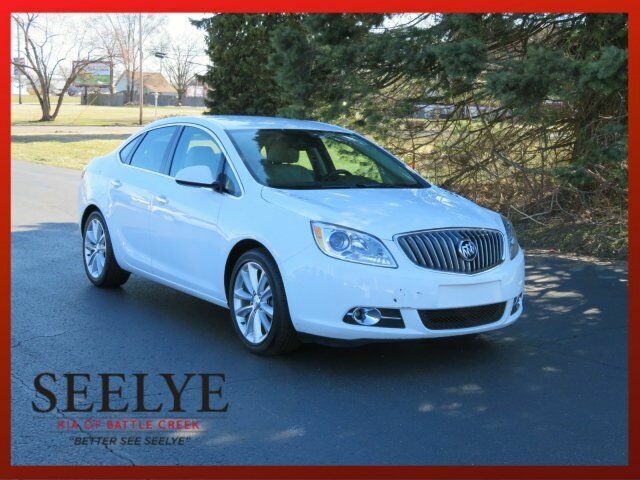 This Buick Verano has a dependable Gas/4-cyl 2.4L/145 engine powering this Automatic transmission. Windshield style, acoustic laminated glass, Windows, power, rear with Express-Down, Window, power with front passenger Express-Up/Down, Window, power with driver Express-Up/Down, Wheels, 18" x 8" (45.7 cm x 20.3 cm) multi-spoke machined faced alloy with polished face and Sterling Silver finished pockets (Includes (RJ0) P235/45R18 all-season blackwall tires. ), Wheel, 16" x 4" (40.6 cm x 10.2 cm) steel, compact spare, Visors, driver and front passenger illuminated vanity mirrors, covered, Universal Home Remote includes garage door opener, 3-channel programmable, Trunk emergency release handle, Transmission, 6-speed automatic, electronically controlled with overdrive includes Driver Shift Control, Tires, P235/45R18, all-season, blackwall, Tire, T115/70R16, blackwall, compact spare, Tire Pressure Monitor, Theft-deterrent system, content theft alarm, Suspension, rear Z-link, compound crank with Buick Tuned Watts for enhanced rear stability, Suspension, front independent MacPherson strut aluminum control arms with hydraulic bushings, 25mm hollow stabilizer bar, Steering, power, electric rack mounted, Steering wheel, heated, leather-wrapped with chrome trim plate bezel, 3-spoke, Steering wheel controls, mounted audio and cruise controls, Steering column, tilt and telescopic. KBB.com 5-Year Cost to Own Awards, KBB.com 10 Most Comfortable Cars Under $30,000, KBB.com Brand Image Awards. As reported by KBB.com: If a plush and quiet ride is more important to you than sharp handling, the Verano sedan is ready to be your sanctuary on wheels. Turbo versions add a cherry on top with quick acceleration and plenty of passing power for not a lot more money.